Rafael was born in France and grew up all over the world. He has always been active in the outdoors but didn’t actually begin to snowboard till he was 17. Now 24, he spends nearly every month chasing snow and adventure in both hemispheres. 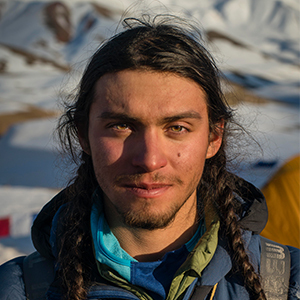 Rafael splits his time between Chile and the United States, where he just completed his degree in Environmental Sciences at the University of Colorado. His plans for the 2018/2019 include going on tour for his new film Yūgen, as well as shred trips to Japan, Canada, Alaska, Europe and, of course, Chile. My most epic splitboard adventure so far has to probably be snowboarding in Kyrgyzstan while filming for the Yūgen project. We recorded multiple first ascents & descents on 15k - 18k foot peaks deep in the Kyrgyz backcountry --> https://vimeo.com/220637667. I am excited about everything, it seems that every year gets more exciting. My film Yūgen is finally done after 3 years of work, and I'm finished university so I have a lot more time this winter to dedicate to snowboarding, environmental work, and filmmaking. Curiosity to go beyond and explore the unknown. The environment inspires me, how things have come to be. This is one of the main reasons why I splitboard - to inspire other people to get out there and to get to know the environment one on one. I ride Spark R&D because I trust the gear with my life. When exposed in dangerous terrain I feel sturdy when touring and riding. The gear is very strong and I haven’t had any issues with the bindings or any other gear while putting it to the test on all types of terrain and weather.